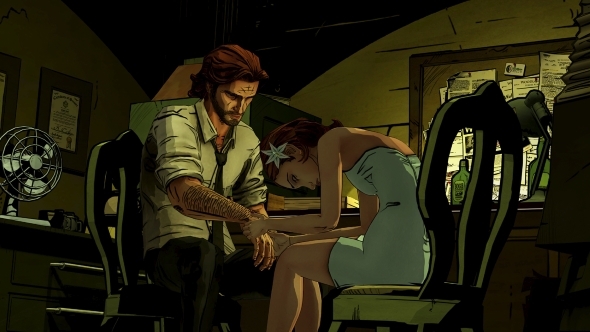 Take a look at what we’re hoping for in The Wolf Among Us season two. Elaborating on the point, Stauffer points to the story’s anchors in film noir. “It’s not out of character for the noir genre to explore a femme fatale ending of sorts, which is largely in the eyes of the player to decide what really happened,” he says. To refresh your memory, the end of The Wolf Among Us sees Bigby Wolf discussing the events of the story with working girl Nerissa. Before they part ways, Nerissa mentions that Bigby is not as bad everyone says he is, echoing the words of murder victim Faith. Fables are able to use glamours to mask their appearance, and the game uses this to create ambiguity: is Nerissa actually Faith? The final choice allows you to chase after Nerissa, or leave her be. “We don’t think continuing on with ‘ok, here’s what happened’ after you went after this person, or after you took a drag of your cigarette and walk away… I mean, wow, that’s an ending, let’s leave that as something to talk about,” Stauffer says. So where will The Wolf Among Us go next, if not continuing that story thread? “We still haven’t firmly committed to when this will be set,” Stauffer says. “The only thing we’re committing to right now is Bigby and Snow White. Such comments opens the door to the idea of a season of The Wolf Among Us set in the Homelands, the fairytale world from which the characters originate. Even if only in flashbacks, it’d be fascinating to take control of these characters during the war against The Adversary. We’ve already explored the social elements of this universe, so how about the pressure of fleeing a war and preparing to become refugees?